I'm so excited today. The Oscar nominations were announced this morning. The Oscar's in this house is a family event. Since the children were very small Irv has handed out score cards and offered a prize to the one who gets the most right. Even if the children couldn't read they check marked a box they liked or rolled dice to pick which one they wanted or just pointed. Then Irv lays out a snack bar of popcorn and candy and it's so much fun to see who gets the most right. Remember it's countdown to sale a bration day on my blog today too! What a great day. Yes. 12 big sleeps until Sale A Bration begins January 28, 2014. 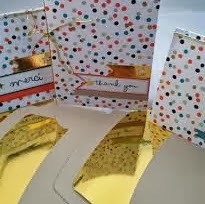 How perfect with the gold lined envelopes and the gold stretchy cord which I love. The gold banner with the star. I can't believe how perfect it is for the Oscars. You get everything to create 8 beautiful cards. I just turned one of the banners into a You're invited banner and Voila! In minutes my invitations were ready to go and FREE. This year I won't hear. "No one told me the date, Mom"